Everybody has heard about the circumstances surrounding the killing of “Cecil the Lion”. 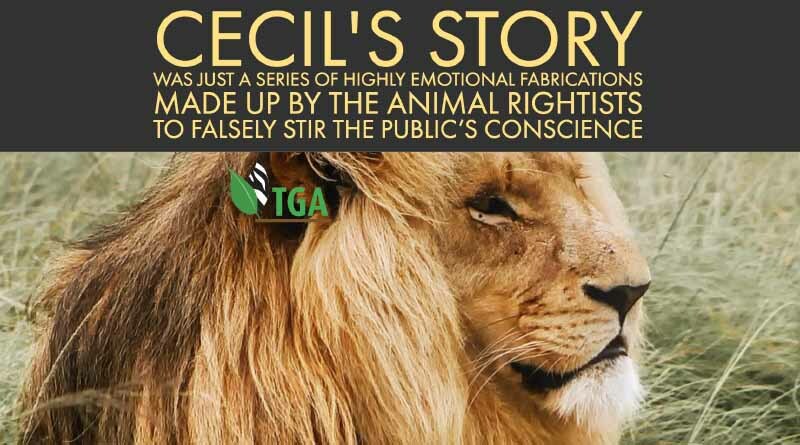 What most people don’t know is that none of Cecil’s story – given out by the AR NGOs world-wide – was true. He was not an important pride male that had been enticed out of Hwange National Park and shot illegally by a hunter. Cecil had been evicted from his pride inside the park by a more dominant and stronger young male and he had been chased away from his former family. So, he was old and surplus to the game reserve’s lion population – and he had voluntarily taken up a permanent new residence (home range) on private land outside the national park. And there he had been shot legally. He was, in fact, one of 65 other lions that had been hunted, legally, outside the park boundary. He was also one of 45 that had had research collars placed around their necks – by scientists from Oxford University in England. The shooting of these tagged lions was part of the scientists’ research programme – the purpose of which was to determine just what happened to territorial male lions after they had been deposed by stronger and younger challengers inside the national park. And what a meal the animal rightists made of Cecil! Yet his story was just a series of highly emotional fabrications made up by the animal rightists to falsely stir the public’s conscience. And like all such contrived lies, the hotter the debate became the more money did it generate for the coffers of the animal rights brigade! And Cecil was red hot! Nobody will ever know just how many hundreds of millions of U.S. dollars Cecil’s story raised for the people who fabricated his demise! I hope the public takes note of this revelation – and starts to distance itself from this mafia. We must start tellling more truths. Hello Edwin. You are dead right. They say: “The truth will always out” and the TGA intends to help “get it out”. The animal rightists’ strategy is to hype up whatever kind of “animal story” crosses their desks – in blatant propaganda – with the purpose of generating hysteria in the public domain, and to generate an emotional backlash to their fabricated lies. Their primary reason for doing this has nothing to do with the animals concerned: it is all about “making money” by fraudulent means. They “create an illusion” to stir up public emotion, then solicit funds from the misled public to make that “illusion” go away! That’s disgusting! Keep with us. There will be a lot more truths coming out. After your kind permission I have published your 4 articles on Africa’s Armageddon on the website I manage and it is starting to get some attention (reading) there. Of course I included a link to the TGA website and hopefully this is resulting in more access to the TGA website. Now I would like to ask your permission to share this Cecil article on the website as well? Whatever appears on our Facebook is already public knowledge so, presumably, anyone can use it as they see fir. But thank you for asking. You have my permission to use this material as you like. There is MORE coming (important stuff) on the Cecil posting – so keep watching. And you can use THAT as you wish also. RESPONSE. Hello Edwin. You are dead right. They say: “The truth will always out” and the TGA intends to help “get it out”. The animal rightists’ strategy is to hype up whatever kind of “animal story” crosses their desks – in blatant propaganda – with the purpose of generating hysteria in the public domain, and to generate an emotional backlash to their fabricated lies. Their primary reason for doing this has nothing to do with the animals concerned: it is all about “making money” by fraudulent means. They “create an illusion” to stir up public emotion, then solicit funds from the misled public to make that “illusion” go away! That’s disgusting! Keep with us. There will be a lot more truths coming out. Thank you for your spot on comment. It is nothing short of ridiculous when it comes to the animal rights groups wanting to protest ANYTHING they can. Ive often thought how it would go if many people released ferel hogs in their neighborhoods. I wouldnt do it, but just the thought. The hogs arent pretty, so thats a different story. But they are animals too. Anyway, thank you. We need people like you getting the word out, and I thank you. Another congratulatory letter. Thank you. The True Green Alliance is very new and our Facebook is only a few months old, but it seems we have hit a chord in the general public with our latest postings. We intend to continue the way we have started – by disseminating the truth and exposing the continuing crooked ways of the animal rights brigade. Our enemy are fraudsters, racketeers and part of international organised crime. We have nothing to be ashamed of by being supporters on the sustainable use of living resources (wild and domestic) – without which mankind would, himself, be faced with extinction. Pure horseshit . . . There is no humane justification for how this lion died. That despicable hunter got the infamy he deserved. Keep in touch. There is more to come on Cecil the Lion. Its tough listening to facts when your mind is made up, right Pam? All we can do is tell you the truth. It is your prerogative to accept or to reject the truth. You can take a horse to water but you cannot make it drink. There is a lot more to come on Cecil the Lion and related matters – so keep in touch. Your integrity and your intelligence will be ultimately judged by society in accordance with the manner that you receive and handle this information. You may not like the idea of hunting wild animals. That is fair enough. THAT is your prerogative – and I understand it. And I will stand by your desire not to be identified with hunting and hunters. 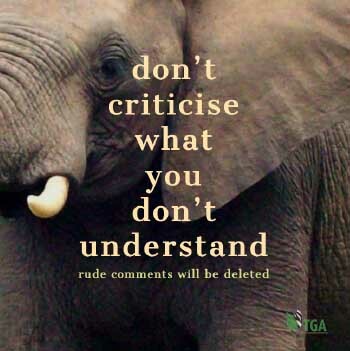 But you have no right to judge others by your standards – especially when your attitude and pronouncements are destructive of the wildlife resource. Remember that! Lets see how your interpretations change – IF they change – as more “truths” unfold. Very well put. My comment would have simply been “moron”. I agree with EVERYTHING said. I also know the truth. You surely represent the truth. Thank you for getting it out. When someone doesn’t even understand the SIMPLE premise of a lion being a non breeder due to several factors, it is impossible to convince someone of the truth. So typical. People want to sensationalize topics for their gain. Simply put- nature sorting things out. That’s ALL it is. You know, there are a lot of very positive people who clearly want to “do the right thing” but they clearly don’t know how. I ask you all. Join us in the TGA, Become a member. Become a member of a legitimate team that is going to make a difference.